An improved version of the G11 assault rifle system. It fires the 4.73x33mm Case less ammo, and has an higher ammo capacity (75 or 100 rounds, instead of the 50 standard with the other G11 models). The carrying handle with an integrated scope has been removed (just like in the previous G11-K2), but, instead of the G11-K2, where an optical sight is optional, the G11-K3 features a standard multipurpose scope; although, this can be removed and replaced with other STANAG optics, because of the lack of iron sights. 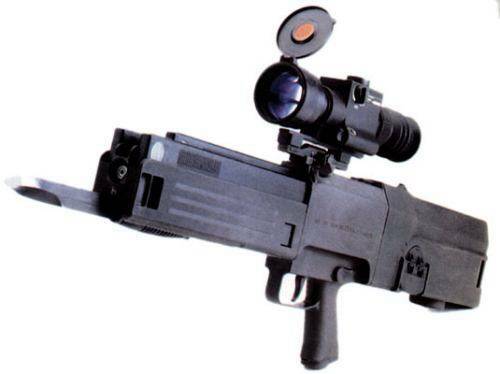 The G11 program was never entered in full production, due to the end of the Cold War and new political reasons; however, some G11s were distributed for field-testing to the Bundeswehr, and rumors say those weapons to be currently in service with some special Bundeswehr's special units, such as NBC Emergencies Tactical Teams. This and other G11s also appear in the hands of German soldiers in many German movies and fictions transmitted to European TVs, and (all you manga aficionados, JOY! ), appears also in the NEON GENESIS EVANGELION: REBIRTH anime movie, in the hands of the JSDF and SEELE soldiers assaulting the NERV headquarters.